"Wilderness of Mirrors" is a high-concept indie/narrativist RPG: a spy game in the vein of Mission Impossible, Alias or La Femme Nikita. The GM provides the players with a vaguely specific goal. The rules as written could provide more advice or examples here; I stressed a bit on what constituted a "specific enough" goal. In the end, I went for color and said, "Find the Art Collector, steal the blueprints and frame SDC." My favorite part: The players then plan the details of the mission. As GM, I don't have to create the "dungeon" for the mission, the players do that. I love this, because it fits the genre perfectly, and fits my preferred style of give-and-take between player and GM "responsibilities" pre- and mid-game. For each "detail" the players add to the mission, I throw 1-3 "mission tokens" into a pool, which are paid to specific players before the mission begins, more complicated details are worth more tokens. In general, when an "agent" attempts a risk, they roll a number of dice and compare the result to a table. Low rolls give the GM full control over the narration, high rolls give the player control, with varying degrees of veto-power/complication in-between. Players can spend mission tokens to increase the pool of dice they roll, or to activate their special power. For every 20 minutes of real time that pass, I add one "setback token" to my pool. (There are other options, we decided pre-game that this might work best.) The setback tokens can be spent to jump the GM control over narration up a "notch", eg from "player narrates, GM gets one veto" to "GM narrates, player gets one veto", or from there to "GM full narration". There's also a poorly explained "trust dice" mechanic, which our group found difficult to digest. We agree that they provide bonus dice for actions that put other agents at risk; we disagree on motivations — why and when a player should want to do this. As stated, I deliberately left the details pretty vague. Our group decided a few things right off, that set the tone for the mission: the Art Collector was "Shinjuro Tokei", a Yakuzo boss, living in a Shanghai high-rise; that he was dating "Candy" a J-Pop singer touring London, and that he would be at an auction at Sotheby's in London. 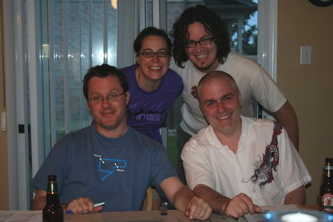 Piers was playing Marcus (Team Leader / Gadgets); Liz was playing Jorg (Hitman); and Hans was playing Jane (seductress). I was worried that this would be too much to accomplish in the time we had (about two hours), and it was (we ran over about an hour), but more by choice than not. In play, Wilderness of Mirrors reminds me most of The Pool, and I GM'd it much the same way I'd have GM'd a Pool game. Which is to say, allowing the players a wide berth to narrate, and using my GM "narration power" sparringly, and to drive complications rather than setting. Our group uniformly read "veto" as "complication" — as in, when the game told us that someone got a narrative veto, we decided that meant, "narrates one fact of complication into the current scenario". This being the first play, I was perhaps a bit cautious; conversation after the game made clear that I could've been more ruthless with complications than I had been. Typically, I'd use my "one veto" complications as easily overcome "color" details, and "full narration" rolls to put on the thumbscrews. Liz/Jorg's "veto" roll for tailing the SDC spy lead to a conversation with a suspicious police officer; Piers/Marcus broke a leg parachuting onto the tower; Liz/Jorg took out Sven, but Ulrike got away; etc. Piers invented a gory detail during play: he volunteered that the "Art Collector" somehow turned his former girlfriends into "living art", taking the codename much further than I'd have, and stoking my theory on collaborative creativity. I took my "goal definition" style from the Cheap and Cheesy Adventure Generator, trying to provide open-ended, flavorful elements. I didn't need to know where the players would go with "Art Collector" or what they'd make of "the SDC" or "the blueprints", and I didn't need to provide answers — the group's collective creativity was greater than what any one of us would have brought to the table. I may not have been pushing hard enough, but I felt like I had a hard time getting the players to fail, even when I targeted weak spots on the character sheet. The genre allows a lot of room for players to help each other out (which may somewhat explain the role of "trust dice": trying to drive a wedge between players), and the intended feel of the game is "Bourne/Bond/Bristow kicks much @$$." There was some related discussion about whether the GM was allowed to spend multiple setback tokens on one roll (we decided not to). I love the open mechanics, and just the right amount of built-in flavor; I'd definitely play again (I'm planning to run a "dungeon crawl" version of this for friends at GenCon), but I'm not sure how many sessions in a row before the spy theme (not my favorite gaming genre) would wear out it's welcome. Actually, the game mechanics are incredibly simple, while the rules text itself seems to prefer brevity over clarity, most of the complication was from interpretation of specific nits, and was settled in a few minutes. For example, like many indie/forge/narr games, it's less than clear exactly how one plays the thing; there's no turn order or initiative, say. Overall, I'd rate it somewhere around Shadow of Yesterday, and far simpler than the average.